As the capital of Peru, the city of Lima has gathered a special mix of attractions, which together help it to express its uniqueness and diversity. Lima is made up of various districts, one of them being Miraflores. This area is considered one of the districts with most historical value and architectural significance, not only one of the most beautiful in Peru, but also in all of Latin America. Aside from its modern style structures and those that date back to the colonial era, there is also an impressive Pre-Colombian archeological sight located in Miraflores called, Huaca Pucllana. The Huaca Juliana or “Pucllana” gets its name from the Quechuan word “pucllay” meaning “game,” and in its entirety can be translated as “a place for ritual games.” Back in its prime days, it was an important ceremonial and administrative center for the advancement of the Lima Culture, a society which developed in the Peruvian Central Coast between the years of 200A.D. and 700A.D. With the intended purpose of having the elite clergymen (whom politically governed several valleys in the area) express their complete religious power and ability to control the use of all the natural water resources (saltwater and freshwater) of the zone, a Great Pyramid was constructed in the Huaca. This great adobe and clay pyramid is itself built from seven staggering platforms. As a whole, the structure is surrounded by a plaza or central square that borders the outer limits and by a large structured wall dividing it into two separate sections. In one section there were benches and evidence of deep pits where offerings of fish and other marine products took place in order to attain the favor of the gods. In its other section (corresponding to its administrative area), there are various small clay structures and huts made of adobe – some of whose walls have managed to maintain upright – whose function seemed to be to act as the courtyards and patios of the enclosure at over 500 meters in length, 100 in width and 22 in height. Other remains have been uncovered belonging to the Wari culture (existing between 500AD to 900AD) which was a direct influence to the Lima Culture society towards the ends of its time period. One such remains to spotlight, are those of the “Señor de los Unkus” (the gentleman of the Unkus) which belonged to the first tomb within the ceromonial center to have been discovered completely intact. This tomb holds three separate burial shrouds containing the remains of three adults – two of which have masks- and a fourth one for a sacrificed child. 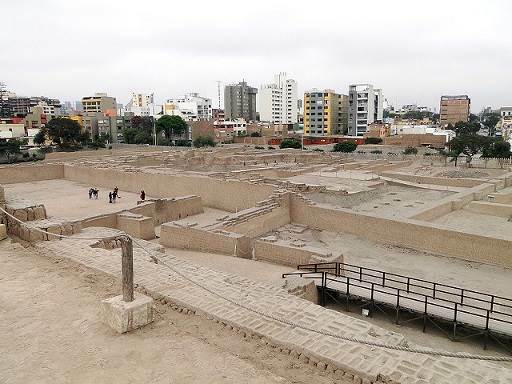 The Huaca Pucllana, which carries the official name of “Parque Histórico Cultural Pucllana”(located at the 8th block of General Borgoño street, Miraflores) is open to the public, Wednesday to Monday, from 9 in the morning to 4 in the afternoon. To enjoy a complete tour of the architectural complex and on site museum, which contains plenty of general information about the Lima Culture and the main findings of the Huaca, you can try using the services of Viajes Giramond agency. They offer to complete your tour with a visit to the National Museum of Archeology, Anthropology and History of Peru. Those that wish to taste some of the best adaptations of traditional and fusion Peruvian dishes, like: Chupe de Cangrego Popeye, el Cau Cau Don Arturo, and the very popular Lomo Saltado, should definitely make a rest stop in their visit and try Huaca Pucllana Restaurant (given 5 fork food and service rating), located next to the ceremonial center.